Michigan Women in Finance is pleased to announce that we will be going Presidential! Our Fall Networking event will be held at the Gerald R. Ford Presidential Library. Located on the north campus of the University of Michigan, the prestigious Gerald R. Ford Library takes you on a journey through the lives of Gerald and Betty Ford, the 38th President of the United States and First Lady. The Library is part of the Presidential libraries system of the National Archives and Records Administration, a Federal agency. Please plan to join us in Ann Arbor for an exceptional evening of history and networking with other public finance professionals. Please note this event is being held on a “Wednesday” evening. Free parking is available in the Library staff lot, located next to the Library. Free parking is also available after 5:00 p.m. in the University of Michigan Blue Lot NC8, located directly across from the Library. 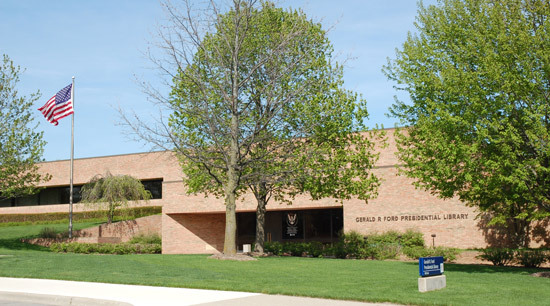 The Gerald R. Ford Presidential Library is located on the north campus of the University of Michigan at 1000 Beal Avenue, near the corner of Beal Avenue and Fuller Road. To view a map of the Gerald R. Ford Presidential Library, click here.